I want to share a simple article about break ups and relationships.. 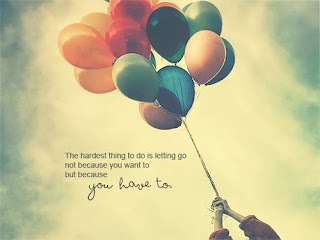 THE ART OF LETTING GO . . .
We often fool ourselves and say that it is love. And when it’s gone, we end up being lonely. So how are we to know that it just wasn’t so, and we just have to let each other go? Why do we have to part when the love is still there? Why do we have to suffer? Why do we have to cry when someone bids us goodbye? Why do beginnings have to end? Why do we have to meet that person only lose them in the end? There are the questions that are left unanswered, words left unsaid, letters left unread, poems left undone, songs left unsung, love left unexpressed, and promises that are broken. In relationships, one of the hardest thing to do is saying goodbye and letting go. It is like breaking a glass because you’ll never know when you’ll be able to pick up the pieces again. More often than not, those who go will not feel the pain of parting, it is those who are stay behind that suffer because of the memories left of a love that was not meant to be. We will later realize that the precious moments you shared together were only stolen moments. At the beginning and at the end of any relationship, we are embarrassed to find ourselves alone. Unfair as that may seem, but that’s the way love goes, that’s the drama, and part of the risk of falling in love. After all, nothing is constant but change. Everything will eventually come to its end without us knowing when, or how, or why. And we have to forget not because we want to but because we have to. In letting go, sorrows come not as a single spy but in battalion. It seems that everywhere you go, and everything you do, every song you hear, every turn of your head, every move of your body, every beat of your heart, every blink of your eye and every breath you take will always remind you of him. And it feels like you have been stabbed with a knife. Funny how the world becomes so bare when in fact only person is missing. Imagining that there are billions people on earth and yet you feel lonely and empty without him by your side. I don’t know of it is worth calling it an art, but letting go entrails special skills combine with considerable space and time. And they would say that time will heal all wounds, yet it also take a litte part from us. Acceptance also plays a part, because after all not every thing you wish will come true, not all love stories will have their happy ending. Sometimes we have to let go because of circumstances that are beyond our control. We have to suffer if it would mean the happiness of the other person. We have to cry temporarily to let go of all the pains we feel inside. whats up!, im new . This website is amazing, ive learned a lot from it so far! It gets down to choose a proper companion who uses your money in a right way - that is incorporate it in real deals, and shares the income with me. In accordance with Our Indelicate Prices at www.Pharmashack.com, The Master [b][url=http://www.pharmashack.com]Online Pill roller's [/url][/b] To [url=http://www.pharmashack.com]Buy Viagra[/url] Online ! You Can also Lineage up up Prominent Deals When You [url=http://www.pharmashack.com/en/item/cialis.html]Buy Cialis[/url] and When You You [url=http://www.pharmashack.com/en/item/levitra.html]Buy Levitra[/url] Online. We Also Engross forth a Mammoth Generic [url=http://www.pharmashack.com/en/item/phentermine.html]Phentermine[/url] In compensation Your Eats ! We Hawk Do business succeed [url=http://www.pharmashack.com/en/item/viagra.html]Viagra[/url] and Also [url=http://www.pharmashack.com/en/item/generic_viagra.html]Generic Viagra[/url] ! I have a Dell Latitude Laptop using Windows XP. I took it to Geek Squad because it was skipping and the freezing up when I played DVDs or any kind of audio. When it freezes I have to turn it off witut shutting it down. It also wouldn't freeze right away..it freezes into about 10 minutes of playing DVDs or youtube videos. It was also making weird noises when it froze. Best Buy informed me that the noise wasn't any hardware issue, but the kind of noise the computer makes when it's frozen. They said nothing was wrong hardware wise, and that I had 6 viruses on the laptop. Well now, all those viruses are removed, and my laptop is still skipping and freezing when I play DVDs..to the point where I have to turn off the computer without shutting it down. If it's not viruses, and geek squad said everything is fine with the computer physically, then what is it?